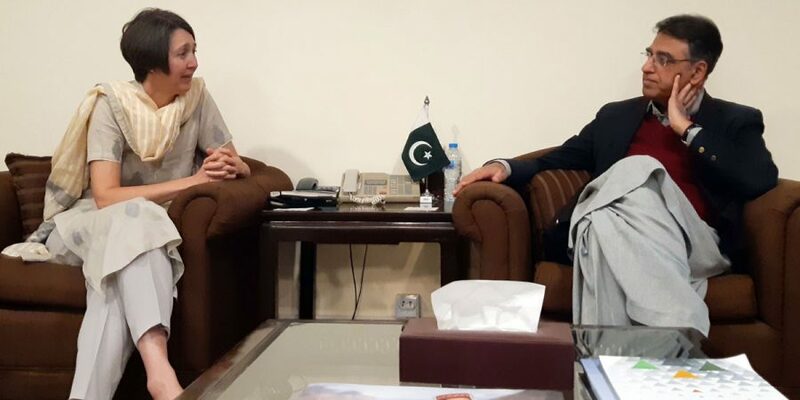 Islamabad: Chief Economist of the UK’s Department for International Development Dr Rachel Glennerster discussed technical assistance and support for economic reforms to improve the investment climate during a visit to Islamabad on Friday. The Chief Economist met with the finance minister of Pakistan Asad Umar to discuss economic priorities including tax, trade and competitiveness, and the business environment in Pakistan. She also stressed the UK’s commitment to support Pakistan’s vision for economic growth and structural reform. During the three-day visit, she met with key government officials, stakeholders from the private sector and members of academia to understand the impact of DFID programmes on Pakistan’s economy and to discuss prospects of future growth and investment, said a British High Commission statement. The Chief Economist visit coincided with a senior team from British Airways which recently announced their return to Pakistan. British Airways has recognised the improved security situation and business environment and see the potential in the UK-Pakistan trade relations. Dr Rachel Glennerster, Chief Economist at the UK’s Department for International Development, said: “The UK is one of Pakistan’s closest partners, and one of its strongest trading and investment allies with $2.8bn of trade between our countries. DFID programmes in Pakistan support getting children into school, improving health and supporting communities, but we are also very committed to supporting the government’s drive to grow the economy and improve the investment climate. This will improve living standards and create jobs for younger people entering the market.” Glennerster added: “To achieve this, it’s important for Pakistan to develop a home-grown economic reform programme. Pakistan will need to widen its tax base and increase investment and competitiveness, which it is committed to doing. We have pledged our support to providing assistance to raise more tax revenue, improve the business environment and invest in a greener energy initiatives.” The Chief Economist also met with the Chinese mission in Pakistan, where they discussed Chinese investments in Pakistan, and expressed an interest in supporting the government in areas of mutual interest.